Today I have one copy of Myth-Quoted by Jody Lynn Nye, the latest book in the Myth series begun many years ago by Robert Asprin and handed off to Nye several books ago, to give away (and an interview with Jody Lynn Nye is forthcoming). 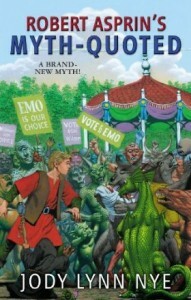 I haven’t read the Myth series yet, but this humorous fantasy series is among my husband’s favorites. He’s read all the books except this one, several of them often enough that he’s had to buy multiple copies. Since it was founded, M.Y.T.H. Inc. has dealt with all manner of vile and evil creatures. But not even a magician of Skeeve’s caliber is prepared to face the most duplicitous monsters of all: politicians. Emo Weavil and his cousin Wilmer Weavil-Scuttil have been running for governor of the island of Bokromi—for five years. Their magickal mudslinging (literal and otherwise) strategies continue to postpone the election leaving the realm in a state of leaderless chaos. To learn more about Jody Lynn Nye, visit her website. You can also follow her on Twitter. 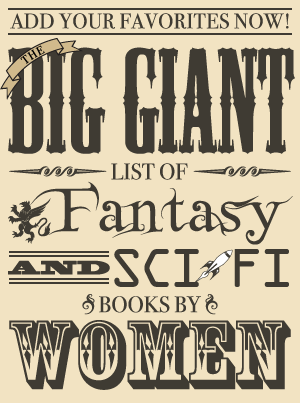 Giveaway Rules: To be entered in the giveaway, fill out the form below OR send an email to kristen AT fantasybookcafe DOT com with the subject “Myth-Quoted.” One entry per person and a winner will be randomly selected. Only those with a mailing address in the US or Canada are eligible to win this giveaway. The giveaway will be open until the end of the day on Saturday, January 19. The winner has 24 hours to respond once contacted via email, and if I don’t hear from them by then a new winner will be chosen (who will also have 24 hours to respond until someone gets back to me with a place to send the book). Update: The contact form has been removed now that the giveaway is over.